Kind of a sad day around here. I sent my best bud of 17 years out to Colorado, to finish out his last days. We have been through lots of hard times, fun times, sad, and angry times, and he has only told me NO once. We spent some time Saturday, dragging calves, just for old times sake, and he did awesome as always. He has always understood when I told him women were mean and nasty, then when they MIGHT be ok, and finally when I told him they were what complemented my life. You wouldn't think that a horse would have this much impact on one person, but SMOKE sure did, and does. I appreciate you giving your good horse a retirement, but what's in Colorado? Sorry you have to say goodbye to your special horse named Smoke. With you wearing those Hollywood sunglasses, a good caption for the photo could be "Smoke and Mirrors." Faster horses wrote: I appreciate you giving your good horse a retirement, but what's in Colorado? I am sorry, that is very hard. I bet FH could recommend a good feed for old Smoke to help keep his weight up and extend his life many happy years. has done miracles for horses. He is 20, I got him as a 3 year old. Have had his teeth checked on a regular basis. As a young horse, up until he was 7, he got the snot used out of him, and everyone told me at the time, if he made it to 15 they would be surprised. Well, here he is at 20, and he still enjoys chasing cows about as much as he used to, just not for near as long. 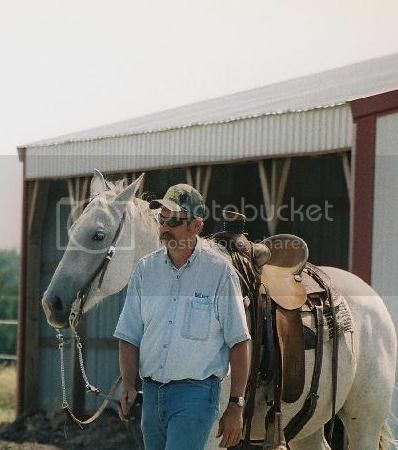 Funny thing is when Nick and I first met, I had always wanted a grey horse. So it was a great package deal! I'll miss the old booger too, he tolerated me pretty well.. But at least I still have my honey! Sorry to hear about that, MsSage. The feed store should be giving you a refund or exchange regardless; it might be an old bag or might have come defective from Cargill, but neither of those options justify the feed store not giving you a refund or exchange, regardless of what the Cargill rep says. We are Cargill dealers and I wouldn't hesitate to take back a bag of bad feed (though it's never happened.... we're less than 100 miles from the Cargill plant here, and they do a great job...).